With most of the UK covered in snow, we've come up with some advice to help you drive on snow and ice. So if you do have to venture out - be prepared and stay safe. Avoid travelling at all unless completely necessary, and don’t ignore police warnings or advice to avoid specific routes. Ask yourself can you work remotely using the internet, or change your schedule? If staying at home in the warm is not an option, the Insitute of Advanced Motorists offers the following advice on driving safely through snow. Ensure your windows are clean and clear, and that you have all-round visibility before you set off. Also take the time to clear snow off the roof of your car. When driving in snow, get your speed right - not too fast that you risk losing control, but not so slow that you risk losing momentum when it is needed. Ensure you have de-icer and a scraper. Before setting off, make sure you clean any ice or condensation from all the windows to optimise visibility. When you set off, do so in second gear, releasing the clutch and accelerating gently, avoiding high revs – this will prevent wheel spin. In an automatic, use the snow or winter setting if your car has one. Do not switch off the ESP/traction control. There are occasions when doing so may help but most of the time much safer to leave it on. Stay in a higher gear to avoid skidding and maximise control. If it is very slippery, in a manual car move off in a higher gear, rather than just using first. If you get yourself into a skid, the main thing to remember is to take your foot off the pedals and steer. Only use the brake if you cannot steer out of trouble. Double or even triple your normal stopping distance from the vehicle in front so you are not relying on your brakes to be able to stop; it simply may not happen. It’s better to think ahead as you drive to keep moving, even if it is at walking pace. 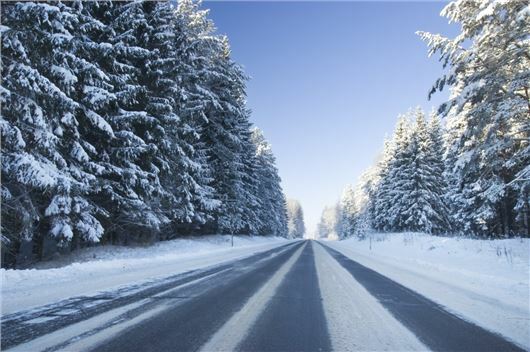 Plan your journey around busier roads as they are more likely to have been gritted. Avoid using short cuts on minor roads – they are less likely to be cleared or treated with salt, especially country lanes and housing estates. If you are heading out, remember to charge your mobile phone (and take a charger with you), take a decent coat and hat plus wear a good pair of shoes or boots. Where you park can help reduce your risk of being involved in someone else’s accident. So look for off road parking where possible or gritted roads if not. Make sure your wipers are in the off position when you stop – they can freeze to the window. Keep track of where you are. If you do have to call for assistance, you need to be able to tell the breakdown or emergency services your location. If you must leave your vehicle to telephone for assistance, find a safe place to stand away from the traffic flow. If you have just lost control, the next driver could well do the same in the same place. If you break down or have to pull over on a motorway or dual carriageway, it is always better to leave your vehicle and stand a short distance behind and to the safe side of it. Don’t stand in front of it if at all possible. Balancing the risks of a collision and hypothermia is something that depends entirely on your situation. If you are using your windscreen wipers, when you come to the end of your journey remember to switch them off before you switch the ignition off. The wipers will go to their 'parked' position (front and rear wipers). When you re-start your car if its frosty or covered in snow the wipers won't be straining against being frozen to the glass or a heavy load of snow. This can cause damage to the wiper blades, wiper arms and the motor as well as the linkage levers. Its a good idea to try to do this every time even in warmer times so that you get into the habit and do it automatically. Hinge your wipers facing outwards after parking -makes it easier to clean the windscreen and avoids the wipers sticking to the glass. Downside of course is making an attractive target for passing yobs. High-visibility vest, a warm drink in a thermos and even a blanket. Here in Sweden a snow shovel is also useful. The advice to take your feet off the pedals in a skid is potentially misleading. If you are driving a manual car in gear, taking your feet off is likely to make the skid worse as unpredictable engine braking will be applied as the tyres regain grip. Far better in practice to floor the clutch, leaving the car in gear and letting the now undriven four wheels find their own speed and grip before gently easing the clutch back in or gently braking - depending on whether its appropriate to go or slow. I've used this method successfully over many years in snowy rural areas and you soon get the feel of what your wheels are up to rather than just abandonning the pedals. Why no mention of winter tyres? I am an advocate of cold weather tyres too. Insurance excess will pay for two tyres. And may save lots of inconvenience in the long run.